A simple starter to prepare for a crowd or family dinner, and it is definitely a summer favorite. This recipe requires a few basic ingredients and is light and tasty. It is a pretty blend of balsamic vinegar, olive oil, garlic, and sweet peppers to brighten your day. When red peppers begin to ripen, this is the right recipe to try. You can use green and red peppers to prepare a bright, colorful meal. This recipe is a healthy pick if you are vegetarian. 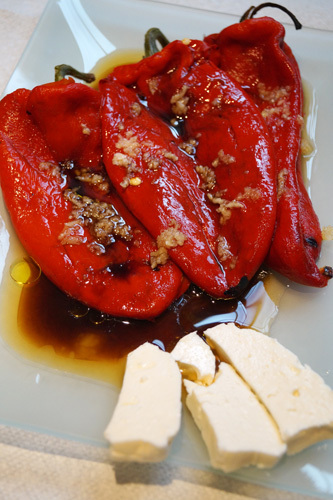 Roast the sweet red peppers on a gas burner or a BBQ; be careful not to burn them. Roast them until the skin becomes black. Remove the peppers from the heat and put them in a brown paper bag; seal the bag and let them steam in for 5-10 minutes. (this will help you peel the skin off easily) Remove from the bag and peel. Arrange the peppers on a serving plate. Use the garlic press and spread the garlic evenly on the peppers. Drizzle with olive oil, and balsamic vinegar. Garnish with Feta cheese and serve.